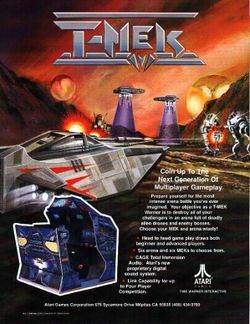 T-MEK is an arcade game involving combat between tank-like vehicles called MEKs in a struggle to possess the throne of the galaxy. Players choose a difficulty and then select from a variety of MEKs. It was ported to the Sega 32X, and later to MS-DOS. Both home versions feature reduced graphics and somewhat altered gameplay. While the arcade game had each player in a separate pod, the home versions use split screen instead. This page was last edited on 24 December 2016, at 00:55.